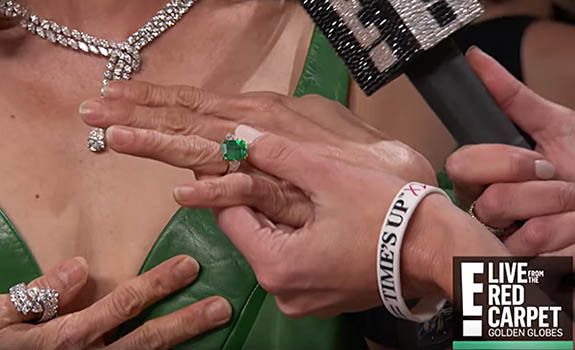 The stunning emerald ring that Michelle Yeoh wore in her starring role as Eleanor in the hit movie Crazy Rich Asians made an appearance on the Golden Globes red carpet Sunday, and E!‘s Giuliana Rancic was quick to take notice. The ring had generated a buzz this past August when Yeoh revealed it was from her personal jewelry collection. Fans of the movie know that the ring plays a pivotal role in the storyline. It’s worn by Yeoh, who portrays the very stylish, but domineering, family matriarch Eleanor Young. Viewers are introduced to the ring when her son’s girlfriend, Rachel (Constance Wu), admires it while the Youngs are preparing dumplings. Eleanor, at first, disapproves of Rachel’s relationship with her son, Nick (Henry Goulding), but later in the film, Nick proposes with the emerald ring, indicating that the matriarch had given her blessing. The movie’s director, Jon M. Chu, had envisioned Eleanor wearing an emerald engagement ring because the green color is strong and regal like the character. The costume designers fashioned the jewelry to look like the engagement ring John F. Kennedy had given to Jacqueline Lee Bouvier in 1952. But when Yeoh saw that ring for the first time, she told the director that it wouldn’t do. See Rancic’s full interview with Yeoh, below. The ring enters the conversation at the 1:32 mark.